Those of you who read my posts last year about Jamaica marking 50 years of independence from Britain might be a little confused by the title of this post. If Jamaica celebrated only 50 years of independence in 2012, how can the Jamaican Maroons be celebrating 275 years? And who are these Maroons? Please read on and I’ll explain. The Maroons are Africans who escaped into the interior of the island when the British grabbed Jamaica from the Spanish in 1655. Some found refuge in the Blue and John Crow Mountains in the eastern parishes of Portland, St. Thomas, St. Andrew and St. Mary. They became known as the Windward Maroons. Others took to the Cockpit Country, an area that covers parts of the parishes of St. Elizabeth, Manchester, St. James, Trelawny, St. Ann and St. Mary. They became known as the Leeward Maroons. Both are difficult and sometimes inhospitable locations which the Maroons used to their advantage when the British, who didn’t take kindly to their slaves escaping plantation life, came hunting them. What the British didn’t count on, however, was the skill and tenacity of these slaves, whose name is derived from the Spanish word for untamed, cimarron, and their unquenchable desire for freedom. Using the trees and vegetation as camouflage, the Maroons were able to beat back the invading British forces. Unable to defeat them after two Maroon Wars, the British decided to join them and signed treaties with both the Leeward (January 6, 1738), and Windward Maroons (1739). Under the treaties, the Maroons were given several thousand acres of land and allowed to live in partial autonomy in communities such as Accompong Town, Trelawny Town, Moore Town, Scotts Hall and Nanny Town. In exchange, they had to turn over any new runaway slaves (eventually becoming slave hunters themselves), and fight alongside the British to defend the island from outside attack. The treaties, which are in force to this day, in effect created autonomous states within the island. The Maroons govern themselves — the Jamaican government can intervene only in cases of capital crime, which is rare among them. All lands belong to the communities – there are no individual owners — and they pay no taxes. Each year, on January 6th, Accompong Town celebrates the anniversary of the signing of the treaty, and the birthday of their founder, Kojo (and brother of Nanny, founder of the Windward Maroons and National Heroine), with a party that draws hundreds of Jamaicans and visitors to their community in the hills of the St. Elizabeth section of the Cockpit Country. There was dancing and drumming when I arrived and I could hear the sound of the abeng, the horn the Maroons traditionally used rally their fighters, and to communicate with others in far flung areas. I followed the sound of the abeng and the gumbay drum down the main road that runs through the community past its small museum, shops, and stalls of jerk chicken, pork, and soup, and clothing, shoes and other items, past the store that blasted reggae music, past clusters of people talking animatedly, and private homes. Everyone was in a celebratory mood. Coming to an intersection, I was directed to a footpath that led directly to the Kindah or One Family tree. 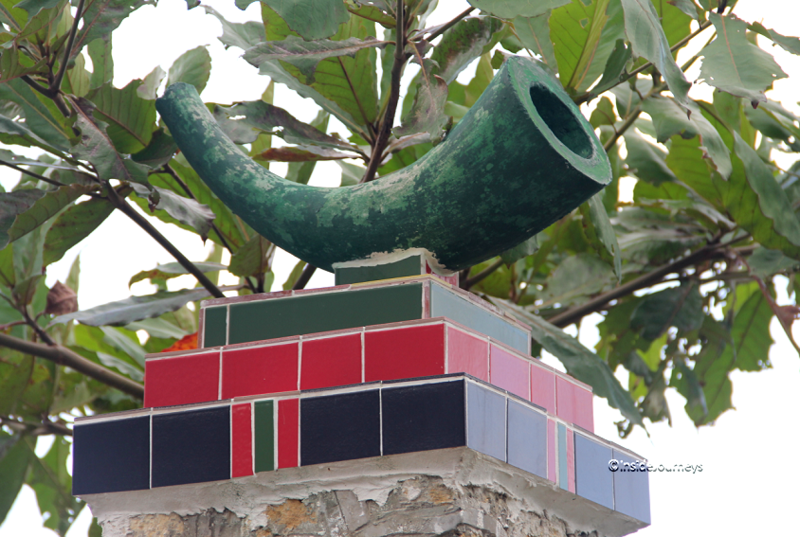 It was under the Kindah tree that Colonel Cudjoe, the Maroon leader, is said to have assembled the Ashanti, Coromante, and Congo tribes to plan attacks against the British. 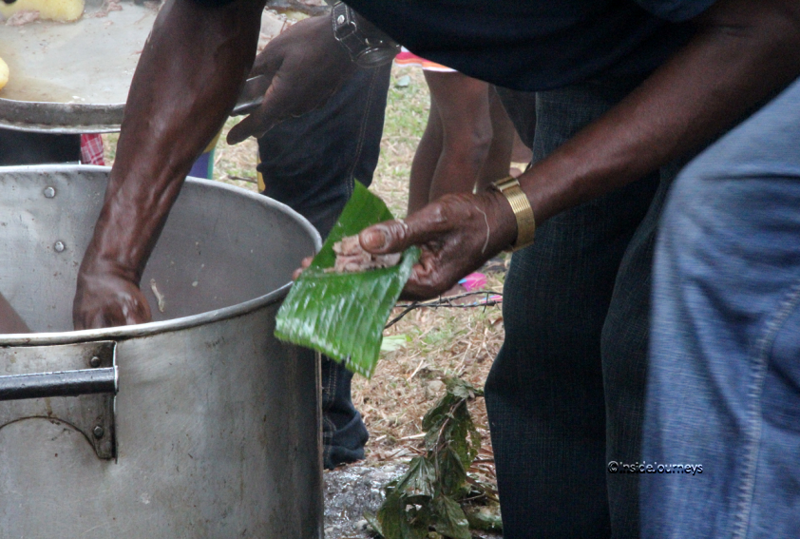 And it is where I am headed to join others who have already gathered to eat pork, cooked without salt, by Maroon men, and drink rum, an integral part of the celebration. Going up a slight slope towards the Kindah tree, I moved through the crowd to get closer to where the men were serving. A tight knot of people were pressed against the little enclosed area where they were. Some, their hands clutching pieces of banana leaves, called out to get the men’s attention so they could get a piece of pork. I was curious to taste this saltless pork but it took a while to get close enough. Except for the lack of salt, it was delicious. As the servers began reaching further and further into the huge pots looking for more pork, the drumming resumed. Everyone abandoned the search and streamed towards where the drummers and singers were. The song was unfamiliar but it had a catchy beat and soon I was humming along and swaying to the rhythm as they sang several traditional maroon songs. Without notice, a woman began wading through the crowd, waving a branch from side to side, causing those gathered to make way. Next thing I knew, one of the male singers was on the ground, writhing and rolling over and over in a trance, the singers following close behind. I watched for a while then moved from my spot just in time to see a procession of Maroons approaching. Dressed in garlands of leaves, they were returning from the Peace Cave where they had gone to feed the ancestors with unsalted food and rum. They were coming back now, one man carrying on his head the empty metal basin that was used to transport the food. I was able to get a few photos before the crowd got in my way. As the procession, led by the current Maroon leader, Col. Ferron Williams (in red and white), abeng blower and elders, reached the Kindah tree, members of the Jamaica Constabulary Force gave a gun salute. 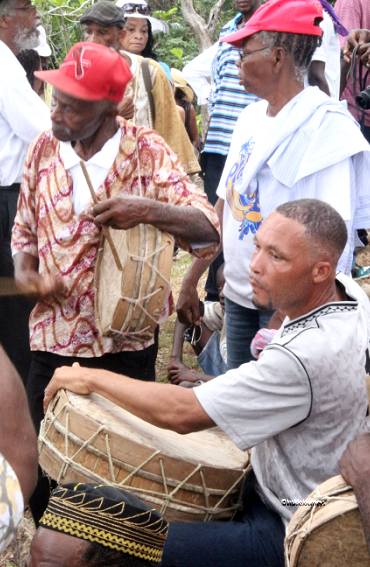 The procession wound through the town stopping at several spots that are significant to Maroon history and culture – the museum, the Sealed Ground, the monument to Cudjoe – and ending at the parade ground for the civic function that would end this year’s celebration. 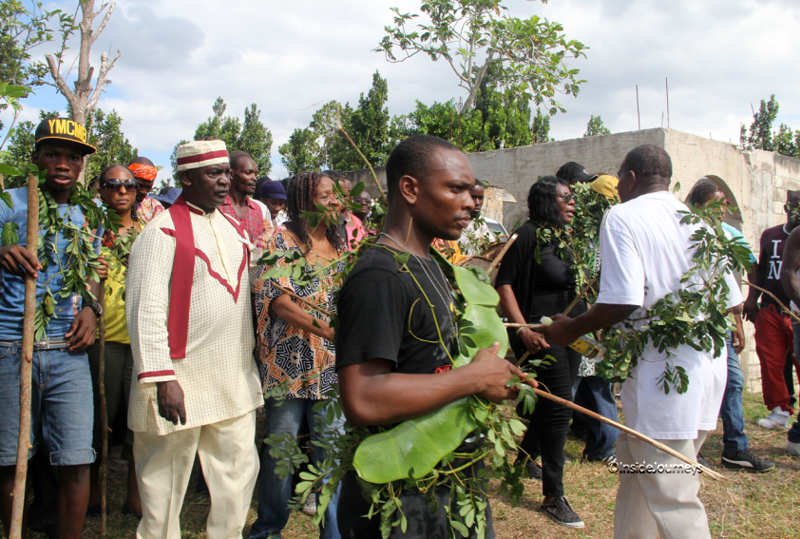 There, officials from the government and opposition, representatives from the US Embassy and the Nigerian High Commission, as well as representatives from other maroon communities brought greetings. Thankfully, the speeches were short because the dancing and performances were spirited and entertaining. As I was leaving, others were arriving by car and on foot. I’m told the party lasts till daylight. When: January 6th beginning around 10:00 a.m. until approx 5 p.m.
Accommodation: There are only a few places for accommodation in Accompong Town and those are rented early. Transportation: Accompong Town is approximately 2 hours from Montego Bay. There are tours that leave from most major locations. Your hotel will be able to make arrangements. I used Kenneth Watson, who I found out later had driven the actress Victoria Rowell to Accompong Town for a documentary she made on the Maroons for the Africa Channel. Call Kenneth at 876-328-8805 for tour prices. What a fascinating bit of history. I had never heard of the Maroons until recently when I read a book by Steve Berry that took place in Jamaica. What a fascinating bit of history and beautifully told. Between drums beating, additional music, dancing and food it sounds like a great way to mark the signing of the treaties. Thanks for the excellent history lesson. I do wonder how they felt initially about rounding up slaves. This is such an interesting post, Marcia! I have never hear of the Maroons and what a varied and difficult history they had. This festival was so full of tradition and honor, it must have been so moving to witness. Thanks for sharing this with us. Good for the Maroons. Same as the Indians, they don’t pay property taxes. They’re stories sound somewhat similar to me. Your passion for traveling and embracing all the newness of those adventures is inspiring. Thanks, Totsy, there’s a lot to embrace. The Maroons were quite special — they loved their freedom and fought tooth and nail to hold on to it. You’re welcome, Mary. It was quite an experience for sure. It was also interesting to see how much of the African culture they’ve retained. You’re welcome, Leigh. I’m sure that must have been a difficult thing for them. It caused a lot of rancor that I think is finally dissipating. Oh, interesting titbit of information: some were deported to Halifax in the late 1800s after a rebellion. They worked on Citadel Hill but couldn’t handle the weather and eventually were shipped off to Sierra Leone. I didn’t know about the Berry book, will have to get a copy. Yes, it is definitely fascinating. I love your posts about the history of Jamaica. I like these rebels very much. Even their name is brilliant – leeward and windward. Has anyone written children’s books about their story – it would make for quite a tale. Yay for self determination – wild things. I have never heard of the Maroons either. Thanks for a fun history lesson. Welcome, Laurel. Actually, there are Maroons in the US as well. Hmm, I’m not sure, will have to check. I agree, it’s a good idea! I was fascinated to read this. Your first sentence? That’s all I knew before about Maroons. As Laurel said – thanks for a fun lesson in history! Jamaica is high on my bucket list, so I’m off to read more of your blog now, since this is my first time here. What an enthralling post this is!!! I never read about the country and its history in such a splendid manner. I gained a lot of vital hints through this post. Thanks a lot for the share. You’re welcome, Linda. I’m glad you learned something new about Jamaica. I hope you cross it off your bucket list soon. It sure is fascinating, Elizabeth. Oh, thank you Aayna! You’re welcome. Glad you found something of interest. An interesting history you have shared here. I had never heard of the Maroons. Thanks for the share. You’re welcome, Fatima. Glad I was able to share the Maroon story with you. Great news about independence. I want to celebrate with them. I always believe in independence of each country. Thanks, Sandra! Yes, it’s great to celebrate freedom.